Chris strides in from the wasteland, most of his innards intact, to deliver the verdict on one of the most hyped games of the year. It has been almost two decades since the first vault opened its doors to the blasted wilds of the wasteland. Over that time much has changed. The stories told have had many voices, and we’ve viewed the wastes from differing perspectives. But in Fallout a few things still hold true. It is a brutal world populated with mutated terrors and human monsters. The remnants of civilisation claw their very existence from the irradiated soil – land which even now is fought over. Kill to take what you want, or keep what you have. Some things never change. The opening of Fallout 4 differs dramatically from the Fallout norm. Here, we are not left under a glaring sun looking out into an ashen waste, but instead see the world directly before it was all wiped out in a tide of nuclear fire. Shortly after sculpting your character from the robust character creator, you and your spouse and infant son must evacuate to the nearest Vault with the promise of salvation from the apocalypse. Anyone familiar with the Fallout mythos will know that Vault Tec was not the benevolent saviour of the world. 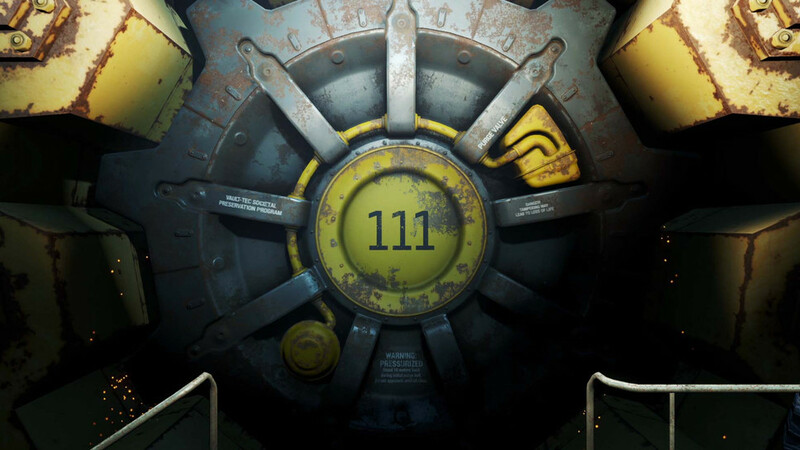 Many of the Vaults had a more clinical and even sinister purpose, and Vault 111 is no different. Our protagonist and family are quickly ushered into small cryogenic pods and put into stasis for experimentation and observation. Waking an unknown period later, you witness the murder of your spouse and the abduction of your son. You soon break free and thus begins your journey of revenge, assuming that’s your goal. 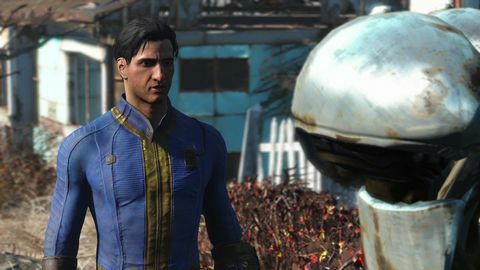 With Fallout 4, Bethesda have focussed more attention than usual on telling an involving and emotional story. The nightmare scenario of a stolen child is something almost anyone can empathise with, and it provides a genuine and compelling reason to push the story forward. It is well written, well told, and wonderfully acted, and the loss our protagonist is experiencing is almost palpable. Unfortunately, this also creates a unique problem: the meat of the game is exploration, and those emergent moments that are the hallmarks of the Bethesda experience. Unfortunately there is a very obvious disconnect between the player relationship to the murdered spouse and lost child and that of the protagonist. That loss, anger and desperation voiced by the Vault Dweller are constantly at odds with the almost casual attitude the game has regarding wandering off to have a look at the next ruin, or acquiescing to a request from an NPC. This is further compounded by the romantic options offered in the game. For someone dealing with the very recent loss of lover and child, every option to depart from that central mission should be a difficult decision, but it is never really presented that way. Your choice to assist an NPC or engage in a romantic tryst feel like insular events, separate and completely disconnected from the core story. This removes a lot of the emotional heft from the game. Bethesda should be applauded for the attempt, but to try and combine this story with the open world freedom the way that they have detracts from both aspects. How much of an issue this is will vary from player to player, and for those wanting to focus on exploring a post-apocalyptic sandbox there is a great deal to love here. Fallout 4 is Bethesda’s most engaging and interesting playground to date! The wastes around Boston are rich with interesting ruins, strange and well-realised characters, and a host of new and returning mutated nasties. All of this is powered by the upgraded ‘next-gen’ iteration of the Creation Engine. While there are very obvious improvements to the engine with excellent post processing effects, richer detail, and vastly improved animation, the engine is already creaking under the weight of this generation of hardware. Character faces remain doll-like, and blurry textures abound. It is never enough to actually detract from the experience, and the game still provides breath-taking vistas of the wasteland, but it’s in the finer strokes and the up-close details where the engine really struggles. Ultimately though, these are minor issues when compared to the massive visual scope of the game, and all complaints are easily forgotten when you see a smoothly-animated Deathclaw weave its way around fog shrouded trees, drop its head, and come in for the kill. 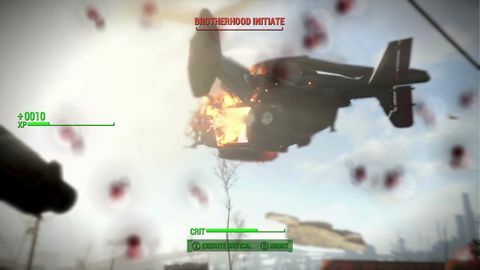 Combat in Fallout 4 is the first real improvement to the Fallout formula. While the gunplay has dropped much of the behind-the-scenes RPG framework, new tighter controls and reactive weapon handling more than make up for it. 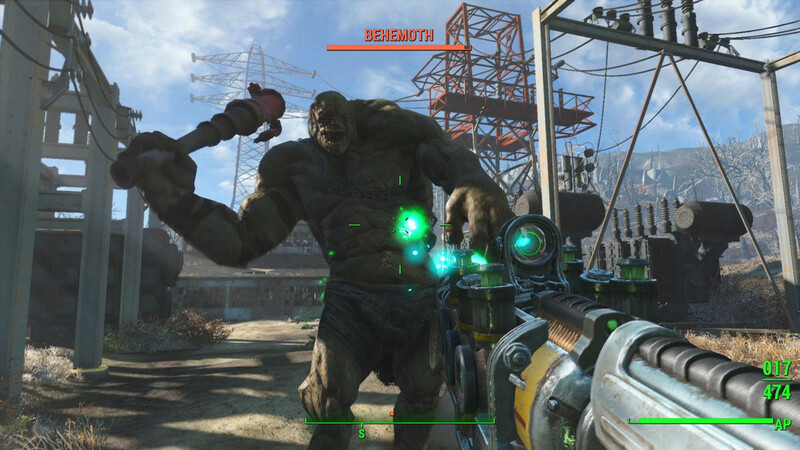 V.A.T.S is no longer required to tackle a massive super mutant behemoth or a swarm of mutated giant insects. While your comparative levels will have a huge impact on the outcome, a skilled player can now use the honed twitch skills to far greater effect. Of course, V.A.T.S is still an option and it too has seen a revamp. No longer is time frozen – instead it is dramatically slowed down. So while you are afforded more time to decide where to aim, there is more risk involved as your foe slowly but inexorably bears down on you. There are also a few new tactics that give combat a lot more depth. Tactical limb removal may be the difference between life and death in many cases. Killing a bloated glowing one outright may take too long, giving a pack of feral ghouls time to rip out your intestines, but perhaps focussing on taking its legs out will cripple it quickly enough to give you the space you need to finish off the pack before finally dispatching it. Different creatures have different weaknesses, and for the first time since Fallout 2, aiming for something other than the head or torso actually makes sense. A new manually-executed critical hit system feels like something that should have always been in the game. Here, successful hits in V.A.T.S will fill a critical meter, which when triggered unleashes a massive blow. It’s a small addition that has a huge impact on how combat flows when in V.A.T.S. In short, combat in Fallout 4 is now not only highly reactive, but even more visceral, and infinitely satisfying. Adding to player options is a new and insanely detailed crafting system. Every weapon can have multiple modifications made to various parts, from suppressors, to extended clips, to improved sights and so much more. Not to be outdone, armour also has an astounding level of upgrades available, and now you can even equip and modify specific pieces of armour – from metal arm braces to reinforced chest plates and so forth. Bethesda, however, is not done yet. 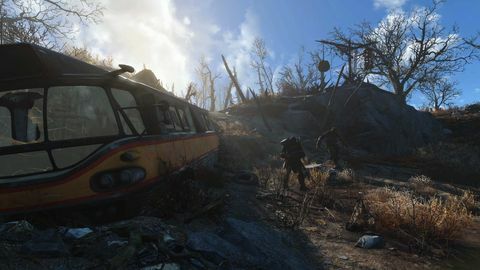 There are also crafting tables for chems, food, and the newly-updated Power Armour. Your new bipedal tank requires a fuel source to run, but it turns you into near-unstoppable killing machine. 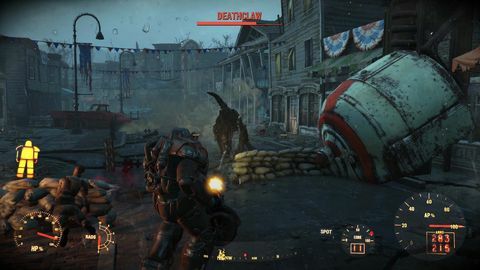 Power Armour has finally returned to its former pre-Bethesda glory! You also have the ability to modify and build upon the settlement of Sanctuary. Like all of the game’s crafting systems, it is completely optional, but will provide a number of benefits to the in-game community, and your character. I sadly was not able to invest too much time in to it, but for the dedicated player it alone will provide dozens of hours of gameplay. For every peak there must be a trough, and sadly the most fundamental mutation of the Fallout DNA here has weakened it. Fallout 3 saw the loss of Traits, and Fallout 4 has now excised Skills. Instead, we get a new Perks system that has spliced the old Skills and Perks system together in a rather clunky and restrictive new system that while completely functional makes levelling more about removing restrictions than building a character. Each of the SPECIAL attributes (Strength, Perception, Endurance, Charisma, Intelligence, Agility, and Luck) has 10 upgradeable Perks, which provide access to abilities such as hacking terminals, improved combat efficiency, crafting options, and various other abilities. This reduces character levelling to numbers game. It is perfectly functional, but feels like streamlining strictly for streamlining’s sake, and does detract from the SPECIAL system. As was the case with earlier Bethesda releases, the PC version is missing a lot of care and attention. The UI is overlarge and intrusive on a monitor. The controls are clunky, and have just been transcribed directly from the console controls. The FOV is fixed at 80 degrees, and outside of the NVidia Gameworks additions, nothing has really been done to harness the additional power of the PC. On my rig (i7 2600k, NVidia 980ti, 16Gb DDR3, Samsung SSD), the game runs at a steady 60FPS clip with all options fully maxed out at 1440p. Oddly enough, there were no bugs of note, so with a virtually bug free 60+ hours under my belt, I am extremely happy with the performance and stability of the game. It’s just a shame that yet again we need the modding community to resolve the persistent PC issues Bethesda refuses to address. Fallout 4 is a massive game, and yet again Bethesda have created a world that is a joy to explore. It’s a shame that the merging of the core story elements and the open world gameplay was far less than seamless, but any fan of Bethesda’s previous games will find plenty to love here. It is also worth noting that the Pipboy app is far more than an interesting gimmick. It interacts directly in real time with your game, and as the first real second screen experience that adds value and functionality to the core game. I highly recommend it Pipboy or not. Ups A great big wide world with plenty to see and do. Interesting main story. Some genuinely emotional moments. A rogue’s gallery of interesting characters. Crafting is rich and rewarding. Pipboy app genuinely useful. Flawless and evocative ambient soundtrack. Solid voice work. Downs Awful UI and clunky control scheme for keyboard and mouse. Dated graphics. A serious disconnect between the narrative core and emergent game elements. New Perk system is too restrictive and simplistic. Not as epic as previous Bethesda-published Fallout games. Where is my FOV slider?